The finished quilt. It's pram sized, so wasn't too onerous to sew. It's been five months since I updated this blog. I'd love to say I've been sewing, but sadly, my machine has been gathering dust while I deal with a back injury that means I can barely walk some days, let alone sew. I've done a few little things though - all presents for new babies. Making something special for a new arrival is my favourite kind of sewing. 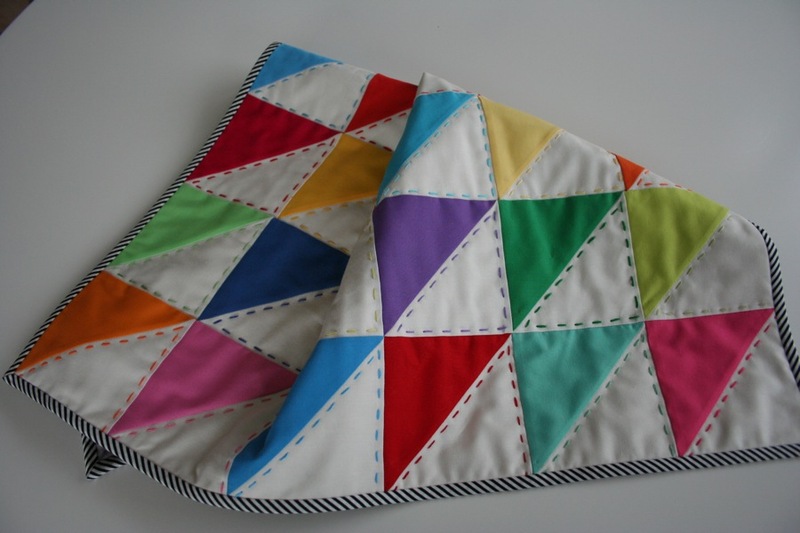 This little pram quilt is for a beautiful baby boy who was born last month. I knew he was a boy before he was born, but really didn't want to use typical 'boy' colours. 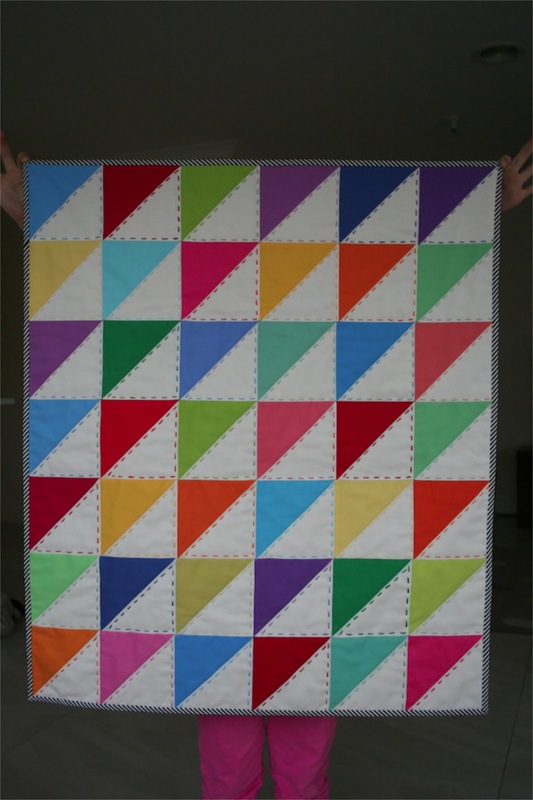 Then I saw this quilt on Pinterest and knew I wanted to make something similar. Hand quilting detail. I used DMC thread. My 5 year old loved matching the fabrics to the threads. I bought a charm pack of Kona Brights and a pack of Kona Snow. I've only ever bought fabric by the yard before, so it was lovely not having to cut it all up. 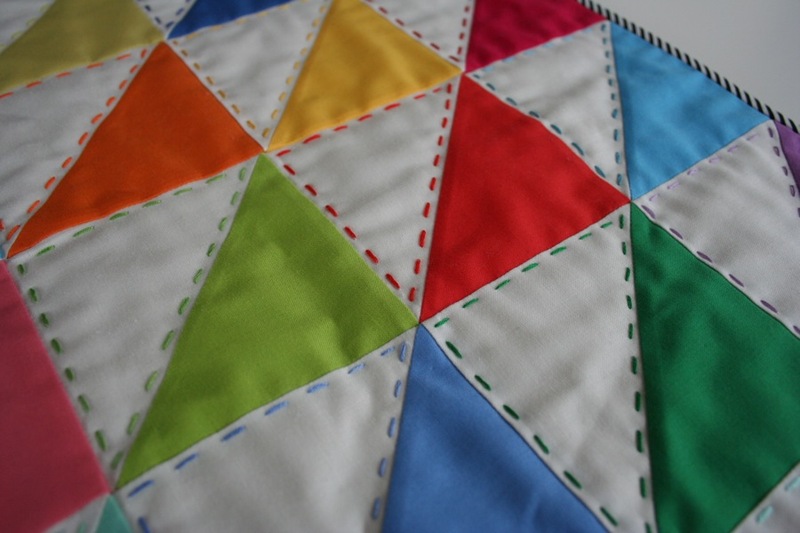 The half-square triangles came together in one evening, and I pieced the quilt the next night. 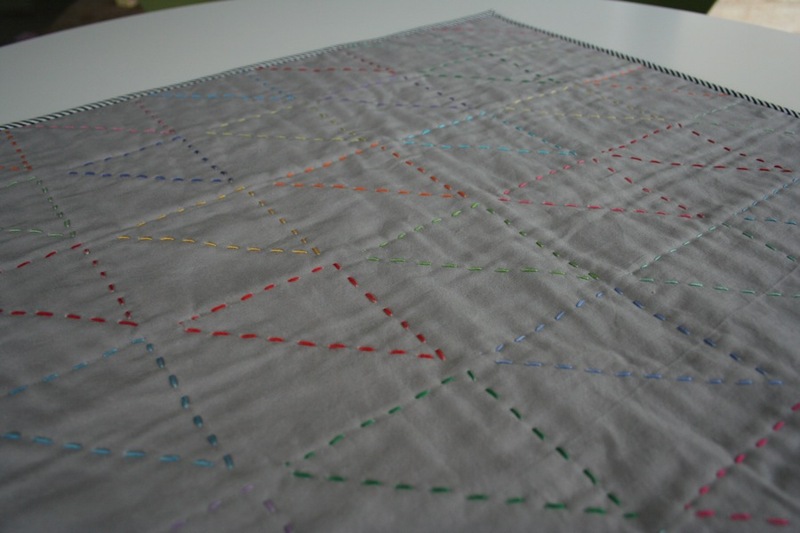 The hand-quilting didn't take as long as I imagined, maybe 4 nights while watching tv? The back. I'm so disappointed in my fabric choice. I had imagined a charcoal grey, but settled for this. I was terrified the fabric, thread or binding would run, so I crossed my fingers and gave it a test wash with a couple of colour catchers. Nothing ran, thank goodness, and I now feel comfortable that my friend can chuck it in the wash without having to worry about colour runs. I really hope to be back to sewing and blogging regularly soon. I miss it! So lovely - such a generous gift. Love the colours and the hand stitching. Claire, you have the most amazing eye. I am sorry you have been poorly, a bad back with babies is hell. I have missed you terribly.